Opera is another popular web browser but it isn't an open source project like Firefox or Chromium. 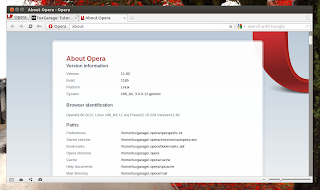 Opera comes with a built-in download manager, Torrent client and mail reader. It has also got other functionalities like Opera Turbo which speeds up the browsing process on computers with slow Internet connections by compressing the web pages via Opera servers. It also comes with Opera Sync which syncs your browser history, bookmarks, passwords, etc. across your other Opera installations. Another thing worth mentioning is Opera Unite which lets you share your content over the web with your friends, only yourself or even everyone by configuring your Opera as a web server, bypassing the complex configurations of DNS, etc. And like every other popular browser, Opera supports extensions and widgets. However, the collection isn't that wealthy as that of Firefox. If you are using a current version of Debian or Ubuntu (incl. Lucid, Maverick, Natty, Oneiric and Precise) you can add the Opera repository to your Software Sources. The repository method is recommended for long term users as you would get updates automatically via the Update Manager.